The Mayor of Brighton and Hove, Councillor Pete West, joined managing director of Brighton Buses, Martin Harris, at Churchill Square to launch a brand new accessibility bus. 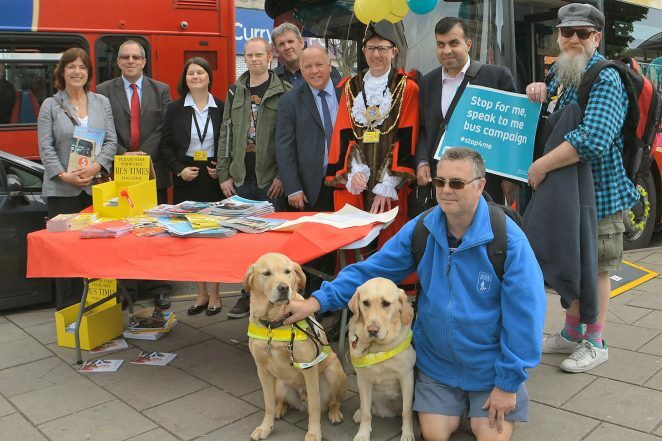 It was also an opportunity to inform people of the many ways the company works to make bus travel more accessible for anyone with special requirements. You can read about the help offered here. Brighton Buses also operates a Helping Hand scheme which has been designed to help bus drivers help customers. Cards are provided free for any passenger that may need extra assistance, or require the driver to be made aware of something discreetly without having to verbally communicate it. The cards display a basic instruction to the driver such as “Please lower the ramp” for passengers that may be unsteady on their feet, or “Call out my requested stop” for visually impaired travellers. Cards can be produced to suit any bus traveller and you can find out more here.